Future radios could have a single menu for DAB and FM stations | What Hi-Fi? 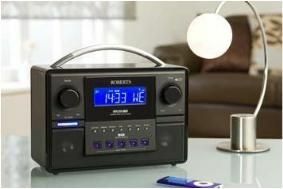 Chip maker Frontier Silicon has developed a new software system that provides a single, combined menu for both DAB and FM stations, so in future radio users could simply choose any station they want by name, regardless of whether it's broadcast on DAB or FM. MediaGuardian was given a demo of the prototype chip at Frontier Silicon's office using an upgraded Roberts EcoLogic 1 radio. Once given a factory reset, then set to scan for stations, it picked up the local DAB stations first, then the FM ones, and sorted them into alphabetical order. All the user then has to do is select whichever station they want to listen to without having to think about whether it's on FM or DAB. Could be handy for car radios in particular.